12 bassoonists 44 friends, 3 courses all together for one night of great fun! 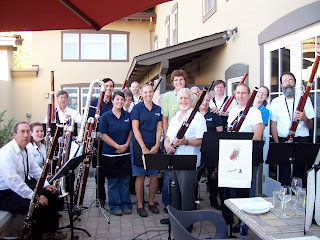 I'm not sure when the last time that you saw 12 bassoons in one spot, but Rupert's enjoyed Ron Klimko's McCall Bassoon Band during a wonderfully fun Friday evening on the patio. The program was varied between classics and more contemporary pieces, and the dinner was reported "excellent" Lots of smiles, and notes below middle C. It's not often that the Bass clef gets to be the star of the show! Players from McCall, Riggins, and the rest of the western hemisphere (you try getting together 12 bassoonists) joined together for Friday night's dinner concert, and Saturday's concert in Depot Park. 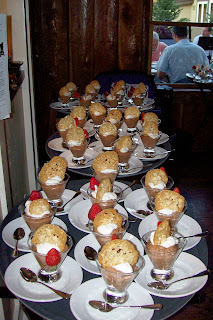 If you would like to be added to Rupert's special events list, please email John Wood at johnwood@hotelmccall.com and we will keep you in the know for upcoming cool stuff at Rupert's.